We manufacture plastic crates using 100% virgin plastic. The crates are used in retail outlets for storing variety of fruits & vegetables. The crates also find other usage in commercial and industrial establishments owing to their meshed construction, sturdiness and durability. 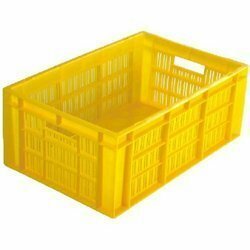 We offer plastic crates in red & blue colors and at very competent prices. To offer our precious clients qualitative offerings, we initiated our firm Labdhi Engineering Co. in the year 2007 as an eminent manufacturing, distributing and trading of Industrial Products. Our offered products ranges include Fire and Safety Products, Industrial Belts and Industrial Pulleys. Our offered ranges of these products are manufactured by using fines grade raw material that is given by the trustworthy and certified suppliers of the industry. To meet the various client’s needs effectively, we are offering these products in various technical specifications. These products are highly recognized among the customers for their optimum performance and unmatched quality standards. Our clients can purchase these products from us at industry leading prices. Owing to our distribution facility, we are able to deliver the offered products safely and timely at client premises. We deal in our LEC brand. To satisfy our clients in an efficient manner, we are offering products them as per their precise requirements and needs within the requested frame of time. For the manufacturing of the offered products as per the industry defined parameters and norms we have developed a highly modern infrastructure facility at our prime over a vast area of land. We are supported by a team of well qualified and experienced professionals. With the help of these professionals, we are able to deliver the products clients place in timely manner. Because of our team member’s hard work and dedicated efforts, we have been able to achieve such a distinct position in the market.